Great post. It is definitively the most probable scenario and deserves attention and training. Likewise, conflict avoidance training is probably more valuable than a “tactical” shooting course. One of the most concerning recurring patterns I’ve noticed while coaching new shooters: they default to covering the threat with the gun, finger on trigger, until trained to do otherwise. It’s not 100%, but it’s a solid majority of the folks I’ve worked with, enough to be noticeable. I mention this because it goes directly to your point about conducting home reconnaissance safely. If the person with the gun is not building in a safety margin for good decision-making by issuing verbal challenges, using a light, and keeping the gun at the low ready with trigger finger indexed… yeah. Bad outcomes are inevitable. Damn it! That’s a really bad thing you will have to live with. For sure it’s better to ask before firing, if you have the chance. Perhaps because I am also a professor (though not at all tactical), I enjoy reading “The Tactical Professor” and have reblogged his work previously. The negligent shooting that occasioned this piece occurred in my adopted home state of North Carolina so it caught my attention. What also caught my attention is TP’s attempt to quantify how rare the likelihood is of having to deal with a home invasion. His point is, it is rare, which is crucial to bear in mind when you have a gun in your hand. David, what is also important is to realize that most burglaries occur during the day when no one is home. This is planned on the part of the burglars so they can avoid a confrontation. 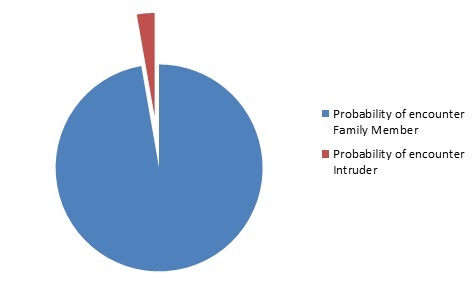 So very few burglars enter homes at a time when people are home.. at night. So the actual risk of an armed home invader is even smaller. Which speaks even stronger to TP’s point….be prepared for the worst but be aware that it’s more likely to be a family member than a threat so caution is appropriate. Also, layering your defenses; lighting, locks, barking dogs, etc are better than simply relying solely on a gun. Excellent blog post, and very important points Claude. If there is one thing I’ve found over the past 2 years, it’s that once you reach a certain level of performance, maintaining a healthy level of mechanics and performance with a handgun is honestly not that big of a deal. More important, IMHO, is placing an increased focus on continually improving your mental game, decision making skills, and ability to perceive a situation in as accurate a manner as possible. Only so many ways to the mechanics and performance of a handgun. There are far more variables at play on the mental side of the equation. Travis, I agree that keeping up an acceptable level of marksmanship competency isn’t particularly difficult once we reach a certain point. What I do notice is a degradation of gunhandling skills over time, even with accomplished shooters. Proper gunhandling involves a lot of conscious decisions about what to do, where to orient the gun, etc. As such, it is both a hardware and software skill. Your comments about the mental side, what I call ‘software’ are spot on. One of the smartest guys in the business commented to me years ago that once we get to a minimal level of performance, our efforts should be evenly split between live gun practice and inert gun practice. The inert gun practice he was talking revolved around the very mental, decisional, and perceptual tasks you mention. so all an intruder needs to do is say “honey, it’s me” or “it’s the police” and the home owner should lay down the weapon and step away from it … ? i don’t think that burglars are the simple minded scripted card boards that people train with. in advocating training for unlikely events, why not take into account a hostage situation? that the spouse is forced by the intruder to respond to the verbal challenge. While the possibility of an intruder being able to convincingly imitate the voice of a family member certainly exists, I think it’s highly unlikely. I’m certainly open to reading any verifiable accounts of an intruder forcing a family member to authentically respond to a verbal challenge. A violation of a basic safety rule: KNOW your target and what is beyond. Excellent article on the importance of scenario based training. Just look at the numbers on the chart. I think this brings up a good point which is to have the means to identify your target not only by verbal challenge (recognition of a family members or friends voice) but also the ability to visually identify a target. A blind shot doesnt have to be through an intermediate barrier. A shot into a dark hallway is just as bad. Therefore, this may require a light of some sort. Possibly attached to the weapon , like an x300, or hand held. This, of course, requires some more advanced training but is, in my opinion, a vital aspect of what you are talking about. Great article, I enjoyed reading it and made me reflect on some of my family’s own shortcomings in such a scenario.